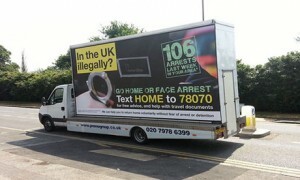 This is the famous mobile poster in London, which the British Government (or one part of it) considers an appropriate way to discourage illegal immigration. Lord Lipsey has reported it to the Advertising Standards Authority. It is widely perceived as a political ploy rather than a realistic method for encouraging illegal immigrants to leave the country. Of course, people who have left their home and family to come here are hardly going to be persuaded by the poster that it was all a big mistake. Admittedly it says 106 illegal immigrants ‘in your area’ were arrested, but it turns out that ‘your area’ includes most of London and Heathrow Airport. What troubles me most is what it says about human nature. Presumably some decision-makers in the Conservative Party thought this initiative would improve the party’s popularity. And, presumably, they knew what they were doing. Anti-immigrant feeling is popular. A few months ago I heard a contrasting story, on Radio 4’s The World Tonight. You have to be pretty desperate to leave your home and family, often risking your life (quite a few die on the journey), to seek a new life in a new country. Most such people come from Asia and Africa, ideally aiming for the European Union. If they can get in, they hope, they can start to build a new and better life. Look at a map of the world and you will see that Britain is not the easiest EU country for these people to reach. For most of them, the first EU country is Greece, with its exceptionally wiggly coastline. Not surprisingly, feelings about immigrants are higher in Greece than in Britain. They have a real neo-Nazi political party, Golden Dawn, with seats in their parliament. It is known for beating up foreigners. They wear swastikas. This is a country that was occupied by Germany for four years in the Second World War. By comparison Britain doesn’t have much to complain about. Oh. Of course. Why do we never hear this obvious comment from his British counterparts? Presumably, because our politicians have got the message that anti-immigrant feeling is politically popular, and their top concern is their own popularity. It shouldn’t be like this. Everybody needs somewhere to live. Everybody needs something to eat. Everybody needs something to do. If you couldn’t get these things where you live, you would try moving somewhere else. The faith communities ought to be emphasising this. Monotheism, the faith of Jews, Christians and Muslims, claims that the whole world was created by the same God. Africans, Asians, Europeans, Americans, we are all, equally, children of God, put on this earth to share its resources and live good lives. When huge numbers of people haven’t got anywhere adequate to call home, it doesn’t make sense to blame them as individuals. There is something wrong with international society, something systematically wrong. Of course people who can’t get a job will resent foreigners who come here and get one. Of course people who don’t have a decent house to live in will resent foreigners coming and living in houses. But it is not the fault of those foreigners. The fault is systemic. That poster is a way of saying ‘I don’t give a damn about you: just go away and leave us alone’. Governments today have lost the vision of international cooperation that produced the United Nations, the International Declaration of Human Rights and the World Health Organisation at the end of the Second World War. We need to regain it. Part of the regaining may be the rediscovery that foreigners are just like us, with the same needs and hopes, created by the same God. This entry was posted in Ethics, Society and tagged Immigration. Bookmark the permalink.